Midnight Update: Naturally, this research is too important to escape a hatchet job by the anti-science Anthony Wassup site. We don't go there or provide links, because the computer needs to get a tetanus shot after dipping in that bilge. However, the intrepid Tamino is already on the case. A new study published in today's issue of the peer-reviewed journal Science shows that current Arctic temperatures are the highest in the past 2000 years. Based on an analysis of lake sediments and comparisons with previous studies of ice cores and tree rings, the researchers extended the previous record of Arctic climate from 400 years to 2000 years in the past. They found that over the 1900 years prior to the 20th Century, there was a slow rate of cooling in the Arctic. 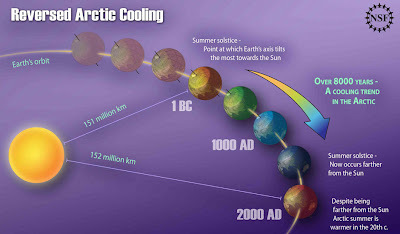 This cooling is consistent with the relationship between small changes in the tilt of Earth's axis and its orbit around the sun. Over the last 7000 years, this has caused Earth's closest approach to the sun to shift from September to January. As a result, the intensity of sunlight in the Arctic summer has been slightly reduced, producing the cooling trend. Over the 20th Century, however, that trend has been overcome by warming which has generated temperatures that are now higher than in the preceding 1900 years. By the year 2000, average Arctic temperatures were 1.4° C (2.5° F) above where they would otherwise have been. Four out of the five warmest decades in the last 2000 years occurred in the 50 years between 1950 and 2000. The temperature history of the first millennium C.E. is sparsely documented, especially in the Arctic. We present a synthesis of decadally resolved proxy temperature records from poleward of 60°N covering the past 2000 years, which indicates that a pervasive cooling in progress 2000 years ago continued through the Middle Ages and into the Little Ice Age. A 2000-year transient climate simulation with the Community Climate System Model shows the same temperature sensitivity to changes in insolation as does our proxy reconstruction, supporting the inference that this long-term trend was caused by the steady orbitally driven reduction in summer insolation. The cooling trend was reversed during the 20th century, with four of the five warmest decades of our 2000-year-long reconstruction occurring between 1950 and 2000. Sept. 2 Update: Added historical 90° data and chart; added links to previous data; added daily temperature chart. PM Update: Added cooling degree data and chart. 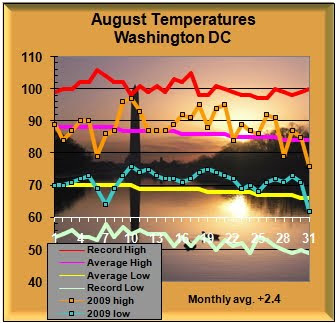 Although June and July (especially the first half) were both relatively cool, August was by far the warmest of the 3 meteorological summer months, so Washington, DC is closing out the season with only the coolest summer in 5 years. 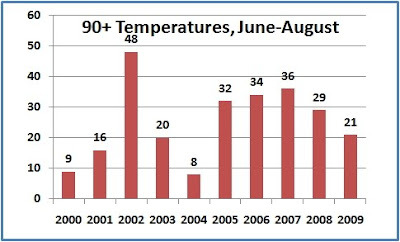 The 2009 summer average of 76.8° is well above the 76° in both 2003 and 2004. Since the summers of 2000 and 2001 were also cooler than this one, 2009 is tied for the median summer temperature of the decade. 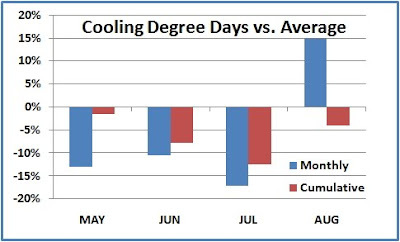 Unlike last year, when all 3 months were above average, this summer started cool but finished with an August that was not only above the current July, but also above the long-term July average. 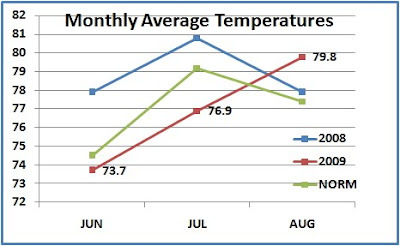 There were 2 days with 90° or higher temperatures in June, 7 in July, and 12 in August. The total of 21 was well below the average of 31. This was the lowest number of 90°+ summer days since the 8 recorded in 2004 and 20 in 2003. Other years in the current decade with lower numbers were: 2001 (16) and 2000 (9). See here for more climate-related humor. As 100°+ heat persisted through August, it became apparent that south-central Texas was approaching an all-time summer heat record. That trend was confirmed last night when the June-August meteorological summer closed out with a record-smashing average of 88.4° at Austin Mabry, 1.7° above the previous high in one of the longest official records in the U.S. dating back to 1854. The 3 highest average summer temperatures have now been recorded at Austin since 1998. This was also the warmest June-August ever at San Antonio and Del Rio. It was the hottest August on record at Corpus Christi. THE 2ND WARMEST AUGUST FOR DEL RIO. THE WARMEST JUNE TO AUGUST PERIODS. MARCH...AND THE LATEST CAME IN LATE SEPTEMBER TO EARLY OCTOBER. WHEN THE HIGH WAS 100...AND THE LATEST WAS 104 SEPTEMBER 28...2005. 30 YEARS AGO ON OCTOBER 3...1979 THE HIGH AT DEL RIO WAS 106. THE HOTTEST DAYS THIS YEAR AS OF AUGUST 31ST ARE LISTED BELOW. A RECORD RAINFALL OF 2.08 INCHES WAS SET AT BANGOR ME YESTERDAY. THIS BREAKS THE PREVIOUS RECORD OF 1.43 SET IN 1950. Thanks to relatively warm and dry conditions earlier in August, this brings Bangor to within 0.09" of the monthly average, but the seasonal total of 16.43" since June 1 is 174% of average. Portland, on the other hand, added 1.68" to bring its monthly amount to 5.15", which is 181% of average. The seasonal total of 22.31" is 236% of average. The yearly total at Portland of 39.26" so far is only a little more than 5" less than the normal amount for an entire year.